The 6th Annual Fire Safety Technology Forum UAE was held in Dubai on 27 April 2016 under the patronage of His Royal Highness Lieutenant General Sheikh Saif Bin Zayed Nahyan, UAE Minister of the Interior and Deputy Prime Minister. Over 160 Delegates to the Forum representing Civil Defence, fire engineering, and other interested sectors and utilities were welcomed by Major General Expert Rashid Thani Al Matroushi, FIFireE, Director General of Dubai Civil Defence, who stated that advances in technology, operational planning and lessons learnt at various international incidents would be examined during the gathering. The UAE Fire Safety Code was first introduced in 2006 to provide detailed specifications and standards at a time when new-build projects were booming across the Gulf region. However, since then, a series of serious tall tower fires, most recently in Dubai’s Address Downtown Hotel on New Years Eve 2015, and more recently in a tall tower in Ajman, both fortunately without loss of life, have caused Dubai Civil Defence to amend some aspects of the Code to strengthen the responsibilities upon builders and contractors to fully meet the stated fire safety requirements. Major General Maroushi said that in all the recent tall tower outbreaks, these non-fire resistant panels have caused very rapid fire spread both up and down the external facades of the structures involved. Contractors are not always following the regulation contained in the existing UAE Code by installing exterior sandwich cladding panels that were not fire resistant rated as they contain combustible material. In all the recent tall tower outbreaks, these non-fire resistant panels have caused very rapid fire spread both up and down the external facades of the structures involved. 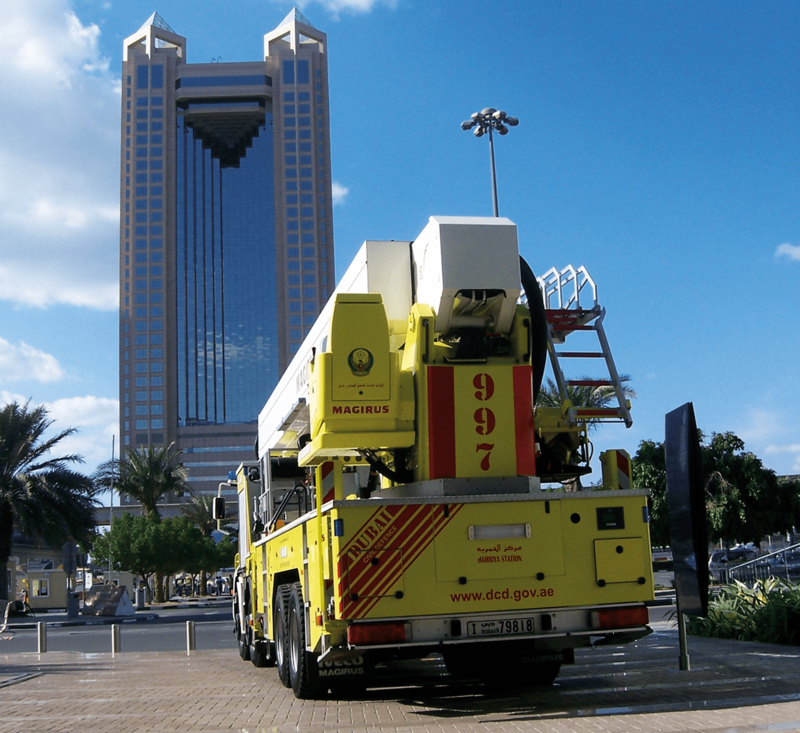 A Dubai Civil Defence 54 metre aerial ladder platform pictured outside the iconic Fairmont Hotel tall tower. Major General Matroushi also stated that other inferior non-fire rated building materials are also still being installed in new buildings – for instance fire resistant doors and their various components. As a result, the revised UAE Fire Safety Code is currently being finalised and is expected to be unveiled in June 2016. The intensive programme of speakers at the 2016 Forum included Lt. Colonel Expert Ali Hassan Almutawa, FIFireE, Director of Operations at Dubai Civil Defence, who was Operational Commander at the Address Downtown Hotel fire on New Year’s Eve 2015; Chief Fire Officer Mark Yates representing the UK Chief Fire Officers’ Association; Barry Lynham, President of Fire Safe Europe and Director of Knauf Insulation; Station Officer Justin Francis of Queensland Fire & Rescue, Australia; and two American Fire Chiefs – Stephen Little from Chicago Fire Department and Gary Morris from Pine-Strawberry Fire District. During the lunch break, delegates were able to visit the exhibition where Forum sponsors included Knauf Insulation, NAFFCO and Bristol Fire Engineering, together with Forum supporters Messe Frankfurt GmbH (Intersec); Dow Corning; Thomas Bell Wright Consultants; The Fire Service College UK; pbi Performance Product, Inc; and Thermarestor. As a Forum Media Partner, Gulf Fire magazine was prominently represented.